Beltronics revamped their windshield mounted radar detectors and discontinued their all time top selling RX65 & GX65 radar detectors and the entire Vector series. They replaced all units with the new PRO Series from Beltronics and there is a new look and many items also now have improved performance and features. 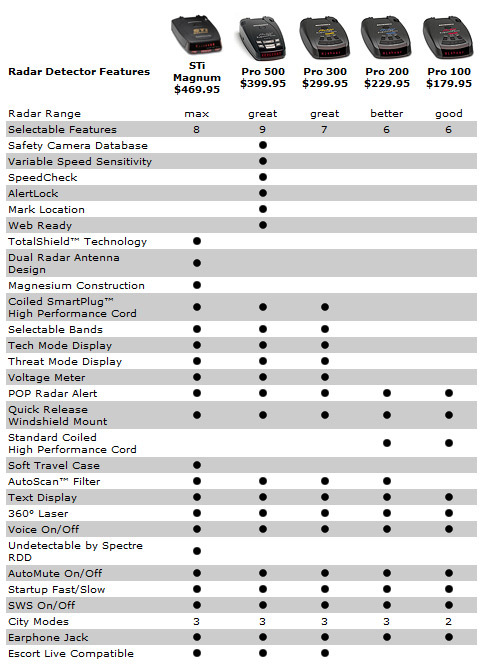 Below is a comparison chart of the different features between the current 2014 line up. There are now 5 current windshield mounted models from Beltronics. The Beltronics PRO-300 is our best radar detector under $300 and the Beltronics PRO-500 is our overall best value for a high performance radar detector with GPS. To see the difference from the older Beltronics RX65 and the new PRO-300 you can visit the RX65 vs PRO-300 Page. If you need help choosing the best radar detector for you needs please contact us and we will be glad to go over your driving situation and help you choose the best unit for you.